Imagine a human being aligned in perfection for a certain task. Kenyan marathoners are. Imagine seeing up close the way human body can move when running at high speeds for hours. The mechanics of it. The strength. The spirit behind it. That just gives a wrong message. It’s not only about the struggles of simple ways of life in Kenya, though the part can not be denied. It’s about an enhanced vision of the phenomena of Kenyan runners. Shown from both social and spiritual sides. Shown with the highest quality of modern cinematography. he risks it all and returns home to help his fellow Kenyans create better lives for themselves. attempting to balance the frenzy of campaigning with the demands of marathon training. ” It’s such a consistent source of pleasure. I’ve never gotten over this feeling of moving rapidly through space. Getting together to watch the movie with other runners – priceless. Getting to see packs of kenyans training together, getting to see Wesley Korir running, hearing his story, his thoughts, seeing a simple human being doing what he does – unforgettable. What I want to do now – is to attempt to bring the movie to Atlanta. There are so many runners in Atlanta – there’s got to be something good coming out of this idea. The movie left an impression of a complete masterpiece from the point of view of how it’s made. The only violent parts of the story were the snapshots referring to the 2008 events in Kenya taken from mass media chronicles. For the rest of the movie it’s – the story of Wesley’s running. His victories, his struggles. His people. Cultural background. The scenic beauty of Kenya. The harmony of runners movements – breathtaking, inspiring, humbling. The film refers to that magical “flow” feeling runners get to experience sometimes. “Flow for me is kind of when I am in that Zone . And there is not ven much going on up here. And it happens a lot during the marathons. And I think part of flow comes with exhaustion . You know, your mind is not going a million miles a second thinking about different stuff. that enviable feeling that every runner has experienced at some point in their running. So the title of the movie, Transcend, completely describes the movie highlight. If you need that extra kick some day going out for a run – get to see this film. It will be your additional notch of inspiration whenever you need it. P.S. Wesley’s wife, Tarah, is also a talanted runner. They are both leading a Kenyan Kids Foundation – for the benefit of kids in Kenya. Jake and Zane Robertson – Two of the main characters in the documentary “Transcend” (thefilmtranscend.com) have been living in Africa the last 6 years without any sponsorship. At 17, twin brothers, Jake and Zane Robertson, left their family and friends in New Zealand and went to where the fastest runner’s in the world train. 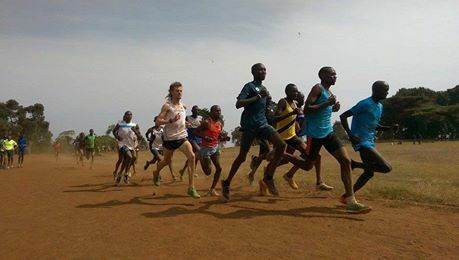 With no money at all they began training with the Kenyan and Ethiopian runner’s in the hope of becoming the best in the world.